At the new Jewish deli, modern meets traditional and Montreal meets Berkeley. Le Montroyal contains 12 ounces of cured, smoked, and baked brisket. Canadian pride bursts out of Augie's Montreal Deli. The white subway tile-clad space is lined with framed photographs of beloved storefronts in Montreal, Canada's Jewish deli capital. Flags for Canada and Quebec wave above the deli case. To the left, a stack of canned poutine gravy momentarily distracts from a neighboring hockey stick, signed by every player on the 1958-59 Montreal Canadiens team and proudly mounted to the wall. Owner Lex Gopnik-Lewinski couldn't believe it when he found the stick buried in his grandmother's basement, and it's just one more detail that makes it abundantly clear to new diners that Augie's is not a New York-style Jewish deli. 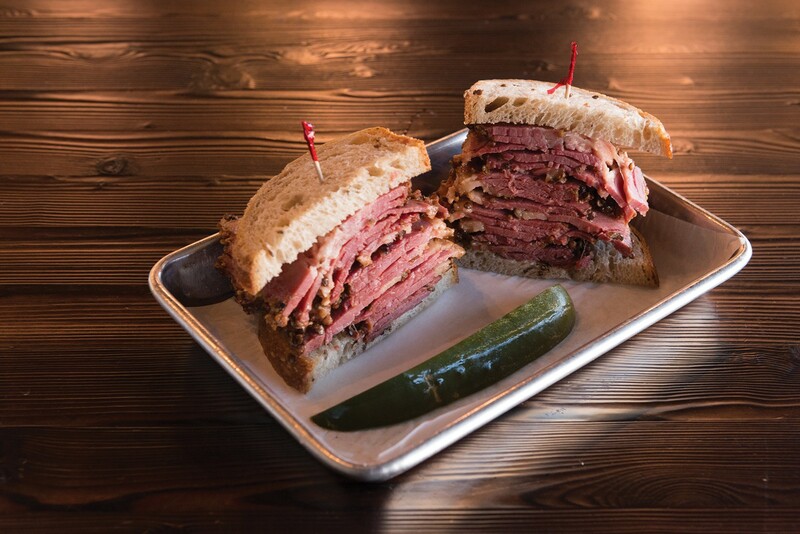 Augie's opened in February with a tight menu of Montreal-style, Jewish deli favorites. There's poutine, matzo ball soup, and the star of the show: smoke meat. In Montreal's Jewish delis, you don't find corned beef or pastrami. You find smoke meat, a sort of cross between the two. And Northern California's French Canadian population is driving — sometimes hours — to the West Berkeley restaurant for this taste of home. It's difficult to overstate Gopnik-Lewinski's passion for smoke meat. He was born in Canada, moved to the Bay Area as a kid, and frequently traveled to Montreal to visit friends and family — and bring back pounds of smoke meat. On one trip home, a customs officer at the San Francisco airport confiscated Gopnik-Lewinski's stash, and he decided it was about time he learned how to make his beloved deli meat himself. He spent a few weeks at the legendary Smoke Meat Pete, located just outside Montreal, to learn the trade. For years, he tinkered with his recipe, eventually launching a pop-up out of Beauty's Bagels in Oakland. That spawned more pop-ups, investor interest, and eventually, his very own brick-and-mortar, launched in tandem with local chef Mike C.
At Augie's, the smoke meat is glorious. Gopnik-Lewinski's team cures beef brisket, rubs it in spices, smokes it for three hours, and then roasts it in the oven for five hours. That final baking period gives it the crumbly texture of corned beef, yet it also has the intense coriander-peppercorn crust you associate with pastrami. You can order it in sandwich form as Le Montroyal, an absurdly large portion that can barely stand, or the more reasonable L'Original, which is still plenty hefty at eight ounces of meat. Either way, the brisket is served with nothing but two slices of soft rye bread. It's an audacious move that pays off — the meat is so flavorful and moist that it doesn't need anything else. Mustard is placed on every table, though, should you disagree. You can request fatty or lean meat — or a mix — and they're both delicious, though I preferred the more luscious, vividly burgundy version, marbled like a fine steak. Either way, the sandwiches come with some coleslaw — zingy with caraway seeds and no mayo — and a sharp, garlicky pickle. Perhaps even more exciting than the meat is the poutine. While Bay Area chefs have been playing around with the Quebec favorite for years, it's been more difficult to find an excellent, straightforward version than, say, banh mi poutine. Augie's keeps it wholeheartedly traditional: fries, brown gravy, and cheese curds. Gopnik-Lewinski fries red potatoes at a low temperature three times — a technique he learned in Montreal — resulting in an extra dark, impressively crispy fry. Then, he tops a mountain of them with cheese curds and St. Hubert gravy, the classic brand you'll see all over Canada, which Gopnik-Lewinski enrichens further with chicken stock, beef jus from the smoke meat, pepper, and coriander. 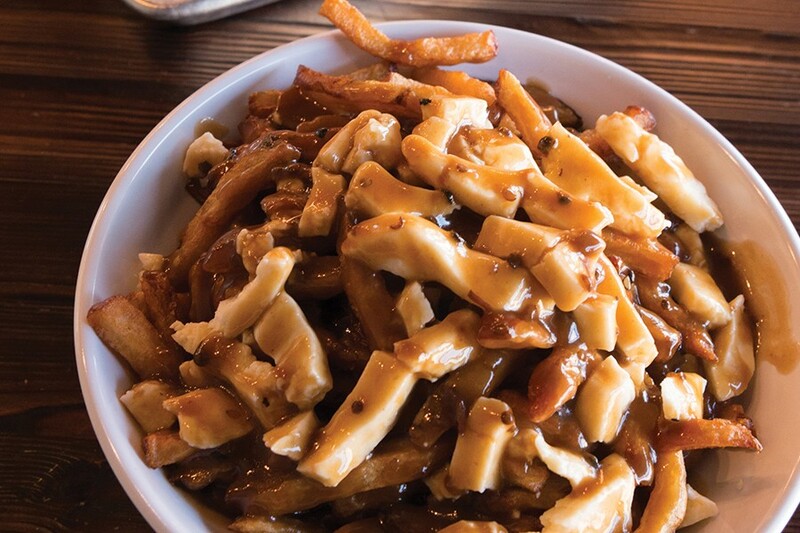 While a lot of local chefs melt cheese curds over their interpretations of poutine, these stay firm and, as they like them in Montreal, certifiably squeaky. And since the fries got cooked three times, they stand up well to the viscous gravy. I loved experiencing this gravy in its even more concentrated, intensely savory form as a dip for a grilled cheese curd sandwich — a fun, albeit less melty riff on the American standard. I even committed the potentially sacrilegious act of dipping latkes into said gravy once I ran out of sour cream and apple sauce — and it was awesome. Those latkes are a secret star at Augie's. Gopnik-Lewinski binds the typical mix of potatoes, egg, and onion with rye breadcrumbs — it's a way to use small end pieces as opposed to throwing them away, but the rye also imparts a subtle earthy flavor. They're shaped petite and thin, allowing for maximum crispiness. While the Montreal bent to Augie's makes it novel and interesting, it's also thrilling just to have another Jewish deli around. Apart from Saul's Deli in Berkeley, there's hardly been a Jewish culinary presence in the Bay Area for many years. Meanwhile, New York's old-school kosher delis have been disappearing — only one remains in the city's historically Jewish neighborhood, the Lower East Side. Though Montreal's Jewish food scene started several decades later, it's only gained momentum, with more than 50 Jewish delis thriving in the area today. Now, latkes, matzo ball soup, and cheesecake feel justifiably Canadian. The poutine is simple and traditional, finished with squeaky cheese curds. At Augie's, Gopnik-Lewinski doesn't make his own cheesecake, but it's a solid, dense-yet-light, tangy version sure to please New Yorkers. The matzo ball soup was total comfort, a combination of Gopnik-Lewinski's grandmother's chicken soup recipe, full of carrots, celery, and shredded chicken, and a single handsome matzo ball courtesy of his great grandmother. The use of seltzer water ensures its lightness. With sports paraphernalia on the walls and four flat-screens broadcasting games, Augie's feels significantly more sports bar-like than a typical Jewish deli. That's not a coincidence — Gopnik-Lewinski wants Augie's to be the East Bay's official hockey bar. The next step will be offering beers on tap. The system still needs to be installed — Gopnik-Lewinski is hoping it'll happen within the next couple of weeks — and will ultimately pour Berkeley brews. For now, the restaurant carries a few Canadian beers in bottles, plus wine. It also has a nice happy hour. Hours: Tue. 11 a.m.–3 p.m.; Wed.–Fri. 11 a.m.–3 p.m., 4:30–10:30 p.m.; Sat. 11 a.m.–10:30 p.m., Sun. 11 a.m.–9 p.m.